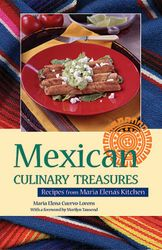 Mexican Culinary Treasures, recipes from Maria Elena�s Kitchen with a foreword by Marilyn Tausend. An authentic Mexican cookbook by Maria Elena Cuervo Lorens is a fascinating journey through Mexico's cuisine and culinary treasures. Maria Elena Cuervo-Lorens born and raised in Mexico City has lived in Canada for over 30 years. She shares her love of Mexican cooking through her culinary classes in Victoria, British Columbia Canada. Chef and author MariaElena has a successful schedule of cooking shows and television interviews. As a member of the International Association of Culinary Professionals (IACP), MariaElena participated in classes and workshops with celebrities such as Julia Childs and Jacques Pepin among others. 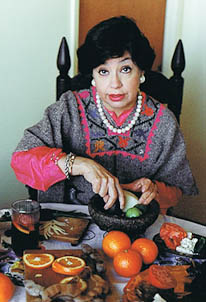 Her recipes have been included in "Cocina de la Familia" (Simon and Schuster), recipient of the prestigious Julia Child Award. In Mexican Culinary Treasures cookbook, Maria Elena Cuervo welcomes you into her kitchen. She takes you back to her childhood, spent around her grandmother�s table on a shopping expedition with her mother to Mercado La Merced, and for a merienda (snack) of caf� con leche and biscochos (Mexican sweet rolls) at a bakery in downtown Mexico City. The authentic Mexican recipes she shares with us include tacos, quesadillas and enchiladas. The nouvelle cuisine of cosmopolitan Mexico City, such as cuitlacoche (huitlacohe) crepes, oysters with chipotle chile, chicken in prune and red wine sauce. This is the real Mexican food recipes cookbook that brings Mexico�s vivid, enticing flavors into your kitchen.